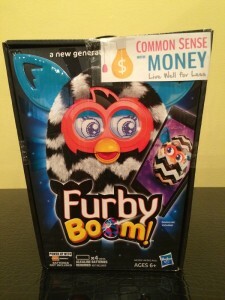 Free Toy Giveaway #1: Furby Boom! Yesterday, I told you about all of the cool toys from Hasbro that I’ll be giving away before the holidays. Here’s your first chance to win one of those very toys now – the ZigZag stripes Furby Boom! What’s your favorite Furby Boom color this year? I’ll pick a random winner exactly 24 hours from now and announce who it is on Monday before 3PM. Make sure you read our original post for rules and additional information, and don’t forget to subscribe to our daily newsletter, so you won’t miss the announcement if you win! We will announce the winner that we choose from the Facebook post comments on this blog post so make sure to check back here to see if you won! I like the triangles one. So cute! Miranda Coyne, who thinks “Triangles are very poppy!” Congratulations, Miranda! How do I claim this prize? I responded to a Facebook message lest week but have not heard anything since. Thanks. Yay!!! My daughter will be very happy. Thank you!